Commissioned by the Ex-Animo Foundation as part of its ongoing commitment to supporting new voices in the creative arts, Matthew Lawes’ The Song of Wandering Aengus brings W. B. Yeats’ poem of mystery and longing to animated life. DN spoke to Matthew about the rigors of solo stop motion and how he managed to gathered an all star group of collaborators – including BAFTA winning Actor Liam Cunningham and Ivor Novello award winning Composers David Holmes and Keefus Ciancia – willing to contribute their time and talents to his enchanting short. What led you to select stop motion as the means to visualise W. B. Yeats’ poem? I have always been interested in stop motion ever since I started making films some 8 years ago, I have always thought it is charming and magical. I felt that it fitted W.B.Yeats poem stylistically speaking, especially as I wanted to create metamorphosis changes throughout which were simply not possible in live action, and unachievable budget-wise with heavy VFX work. 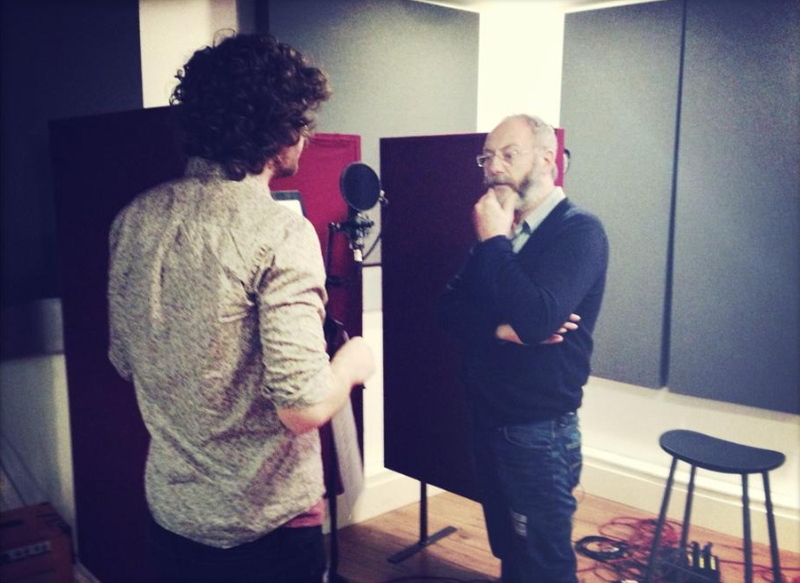 How did you manage to bring Actor Liam Cunningham onboard as narrator and what was your approach to directing his performance, especially as he’s a hero of yours? Yeats was born in Sandymount, Ireland and this poem is based in Sligo. I therefore knew that we needed an Irish narrator and it needed to be someone with a great voice. I wrote two names down on a piece of paper and showed them to the films Producer Marlena Hellebø – one of these names was Liam Cunningham. I had no idea when writing his name down, but she happened to know Liam. I am one very lucky filmmaker. I was terrified on the day of the voiceover recording. Not so much because he is a hero of mine, that was just a privilege really. What scared me most was not having to say anything – because he is so experienced. I was worried that he would do his first take and that would be that. Thankfully I was able to give him some notes, mainly parts of the poem that I knew needed emphasising for the visuals, it’s surprising how fears dissipate once your wholeheartedly stuck into something. The build up to that day was the scary part I guess. Character and set design are crucial elements of a project such as this, what was it about Olga Lunina’s work that made you ask her to create the puppets? This film would not have worked without Olga. I found a few images of her dolls on Pinterest around the time that I was thinking about the style of the film. We met up and she revealed that she had no formal training. This is a trait that I love, because people are a lot less afraid of doing something wrong and much more up for experimenting as that’s the process that is natural for someone with no hard edged formality to their process. Olga’s work is magical and fits perfectly to a surreal and beautiful landscape, she is also a lovely person and very hard working – both traits that are important when collaborating with someone on a short film that ultimately is a passion project for all involved. It’s surprising how fears dissipate once your wholeheartedly stuck into something. How long did the stop motion animation process take? It took me 1 month to animate the film, but it took 4 months to create the sets before that. Making the river was an interesting process, including using floorboards and shower glass and multiple lighting set ups to get it right. Being a solo-animator the main trick was to stay focussed and not procrastinate, as I only had myself to blame if that happened. There were times where I was animating 4 or 5 elements per shot, that was a test of concentration more than anything. The hardest shot was probably the tree growing at the end. The whole thing was made out of thin wire for the structure, with tissue paper, glued and painted to it, to resemble bark. I had to cut through each branch in millimetre increments, with the hope that it would reveal itself once reversed in post. That one shot took me around 16 straight hours to animate. With the animation shot, how much additional work was required in post to bring the film to life? Post-production took 1 month to complete. I did a lot of the more boring jobs like removing rigs, but I also created the bursting moth scenes which were fun. The person with the real skill in this phase was Felip Docolomansky who was working at Blink at the time. He composited all of the smoke, the mist that sits in most shots, as well as the water splashes and underwater elements. He is really talented and a pleasure to work with. Ivor Novello winners David Holmes and Keefus Ciancia composed the film’s score. How did you pitch the project to them? When I met Liam Cunningham he spoke about a friend of his called David Holmes who might interesting in scoring the film. He put me in touch with David and I spoke to him on the phone. Initially I had a track on the animatic just to help guide the pace of the piece. David asked me why I wanted to get him to compose a piece of music when I could just license the piece attached to the animatic. I told him that as it was an animated film and everything in it was painstakingly hand-made for the film, it would be much better to have music that was made in the same fashion and not stapled on at the end. Thankfully he agreed and wrote a beautiful piece of music alongside Keefus Ciancia. It was very surreal working with such successful people. I count myself very lucky for the opportunities that were created as a part of this short film. You recently selected the winner of the Other Brother Studios film fund. How does the fund work and what can you tell us about the winning entry? This year I decided to start a film fund with my production company Other Brother Studios. I wanted to give an emerging filmmaker the same opportunity that was given to me when I made my first ever short film in 2011, so I matched the amount of money I was given (£400) and said that I would provide mentoring as well as access to all of my equipment. I read some absolutely terrific submissions, however there could only be one winner and the first awarded recipient is Milda Baginskaite. I won’t reveal too much about the film, as Milda is currently working hard on it, but I will say that it is a charming script with a great message and I am greatly looking forward to seeing the finished film. I’m doing a lot of commercial work at the moment. I also have a few shorts up my sleeve and I want to start creating one of those ASAP. Ultimately it’s a constant balancing act between the two, but I’m not rushing the short film side of things – I want to get it right.